My 2000 Subaru Outback needs to be repaired or replaced. I barely like the car, so I'm looking at replacing it with another wagon. After some CL searching, it looks like the going rate for a decent circa 2004 V70 wagon is about $2500. What am I getting into with these cars? Any model-specific issues to be wary of? Regular 5 cylinder stuff - PCV system, timing belt done on time, etc. The automatics do not last forever, later (2004+?) are better, IIRC. Electronics. Make sure everything you care about - power seats, gas gauge, climate control, etc works, including keys and keyfobs. Most everything is dealer programmed only. Good to know about the auto trans. I'll be looking for an auto so my wife can drive the car, so maybe I'll look into those issues and focus on later models. Thanks! Get an 05-06 if you can, pretty darn solid cars overall. There's been a few in Sac that pics looked pretty nice for the $3-5k range with decent miles. Basic maintenance is key. Pull the oil cap and see that it's clean and not all carboned up. Timing belt is due around 100K miles, or every ten years. Its simple to change. Youtube has some video's. Rear axle is hammer solid. Front - make sure when accelerating or braking it goes in straight line. Might be problem with steering rack or broken wishbones bushings. All electrics should work - check if rear door locks and unlocks each time and rear screen wiper motor works. Also known problems with power seats (sometimes motors brake down). I would look for 2005+ models with newer front headlights and rear lights with led side markers. I'm driving 06' v70 for over 100k miles and I'm happy with its comfort seats and economy (but I got 2,4d called D5). My 2004 V70 is an absolute piece of **** - I would strongly advise against purchasing one. Can't speak to other years but that one I have a good deal of familiarity with. At least in my case host of electronic issues, and they have a history of airbag issues that require an inordinate amount of investment to fix if you happen to have the issue. If your "siren" burns out you will have no end of electronic malfunctions. I would suggest just like a 240, to buy the newest, best model you can afford. I believe it was 06 that went to the six speed auto transmission. My R has been pretty solid all things in comparison- as in all cars break and all cars can provide electrical nightmares. I am sold on the P2s. Chassis stiffness, safety, etc. FWIW, I skim CL here in the Chicago area, and the newer well maintained cars from the north shore bring $4-5k, but they come with maintenance books. Have fun. Good luck shopping. I would look for the lowest mileage MY 06 or 07 you can find. The more maintenance records the better. Timing belt, tensioner and waterpump replacement. It's cheaper to do it all at once. I've never had to mess with the PCV system of a P2 car... thank god. IIRC '06 6 speed automatics can have valve body issues. If you have 100K miles, its due for service. Thanks for the advice, everyone. I'm bummed to hear all the negative reviews about the '04, because there's a clean looking one for cheap. How is the AWD system on these? 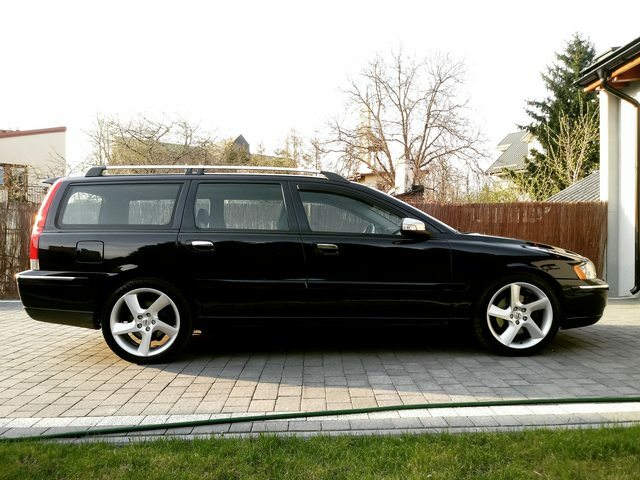 For an AWD V70, that is a good price. IF there are good records. From what I remember shopping for these is that the 07 and 06> 05and 04> 03 to 01. As ovlov760 alluded to (I bought his R), timing belt and solid maintenance is key. If the all the warning lights are off as the pics show, then everything should be working. There is no way of predicting what will go wrong. On my now 154K 2006, the angle gear was repaired, rear haldex DEM rebuilt along with a new pump,and ovlov had all he mentioned completed when I bought it. I just got back from a 900 mile road trip and would not hesitate to do it again in a heartbeat. Also if you have not driven one, the seats are sublime. It does seem like a good price. I'll see if I can find out when those big maintenance items were done, if ever. And no, I've never even ridden in one, I don't think. Hoping this '04 is a nice example. Yeah, the drive-by-wire thing doesn't excite me. I've heard a few others complain about throttle body issues, too. In our fam we have a fwd na 04 V70 stick with 200k+ miles and a fwd 05 V70 auto T5 with about 125k miles. The 04 is much closer to an actual Volvo feel, the 05 is way faster, the 04 with the stick feels quick and the shifter/clutch is very nice, but the 04 has required less, when midnight/2am/4am rolls around and the 05 alarm won’t stop its a $700 trip to the dealer, but the 04 is a bit more simple in that regard. Also the T5 has 4C which is stiff and slammy the 04 suspension is much nicer although maybe not in screaming situations. I just replaced the throttle body on a family members '04 S60 2.5T with a xemodex unit. It was a significant savings over what the Chicago area dealer quoted for the job. Xemodex claims they improved the design of the OEM module. No drivability complaints, "reduced engine performance" messages or fault codes after two months... knock on wood. We like our '04 V70R a ton, normal stuff has come up, Changed a wheel bearing, the front bumper is saggy, had a headlight ballast take a dump, but other than that it is reasonably quick (bone stock), and comfortable. 05-07 are the golden years. Find a nice, well maintained FWD and it will treat you nicely. I picked up a 1-owner, dealer serviced 07 V70 2.4 last August. I've put 8,000 miles on it already. Great car, super comfortable, 30 MPG on long trips, not a rocket ship but it does everything well. Avoid 01-02 like the plague, even some 03-04s are sketchy. Good maintenance and care makes the difference between a good daily driver and a money pit. Heat gun, gently push up back flat. Then use a very thin aluminum rod and some JB Weld on the inside of the lip to help maintain the proper shape over time. It worked great on my 04 R.
That car linked looks good. Shame that the driver's seat looks like poop, leather is easy to maintain if you stay on top of it. Might be wise to pull the seat skin and find a nicer one on Ebay. On my 04, I went through wheel bearings because that car had rust. I blew though angle gears because of the HP it made, but it's a car I loved and I regret selling it. My '05 T5 has been 100% rock solid reliable. I've put 40k on it in 2.5 years, and the only non-maintenance related issues were a torn cold side intercooler hose, and a fuel pressure sensor that failed. That's like $50 in unexpected repair costs. I also did CV axles a few months ago. Those were cheap and easy. It's due for ball joints ($60ish for Lemforders) and I'll probably do tie rod ends too while I'm at it. My '05 T5 has been 100% rock solid reliable. Good feedback, thanks everyone. I haven't ruled out the '04 AWD turbo, but the guy is pretty stingy with information, which is annoying when I'd have to drive an hour each way to look at it. But really, I'm thinking that for my daily driver, I don't need AWD or a turbo. There's an '05 FWD non-turbo nearby and I'm thinking that would be a better choice. I would not think an AWD would be a "have to have" in your climate. It would for sure cut down on potential repair costs. Non-turbo, I don't think I would want to go that slow. Haha. Good luck with your search! Bought mine for $5K. It's a great looking car but as a daily driver it would be a giant PIA. In my case it's basically a car for my GF when she's in town and a utility vehicle for hauling stuff etc. Anyway I hope you wind up with a sweet ride that you are happy with.